Working at the San Diego County Sheriff’s Department offers you an opportunity to make a difference in your community. You will not just be earning a living; you will have a rewarding job that allows you to help and protect people. We are passionate in what we do and want you to be too. We offer competitive salary and retirement benefits. Staff is entitled to two weeks paid vacation and nearly two dozen paid holidays. We support flexible and family-friendly working arrangements supporting maternity/paternity leave, adoption leave and special leave for emergencies. We are committed to providing the tools, resources and support to finding a position that best suits you. If you have a strong urge to be of service, protect lives and property and make your community a safer place to live, visit joinsdsheriff.net. We have been “Keeping the Peace” in San Diego County since 1850. We have grown to a department of nearly 5,000 sworn and civilian employees. We house more than 5,200 inmates in our detention facilities. We keep safe 168 courtrooms at nine courthouses throughout the county. We also provide law enforcement services to numerous cities and unincorporated areas throughout the county. You can expect great pay, flexible schedules, amazing benefits, ongoing training and advancement opportunities. You won’t be stuck in a chair and cubicle. 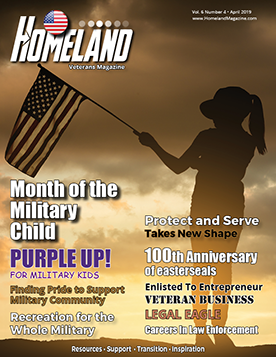 Explore a variety of specialty assignments from ASTREA (helicopters), Bomb/Arson, Car Theft, Family Protection (Child Abuse, Elder Abuse, Domestic Violence), Gangs, Homicide, Internet Crimes, Intelligence, Narcotics, SED/SWAT, Search and Rescue and more. You can work in charming beach communities or be surrounded by majestic mountains and sparkling lakes in San Diego’s back country. Like the community we serve, we come from all walks of life. We work tirelessly to uphold the highest standards of community policing and public service in an effort to make San Diego the safest urban county in the nation. Here at the San Diego County Sheriff’s Department, we understand the importance of a career decision. Come explore your options and discover how your military skills and calling to serve your country align with ours. 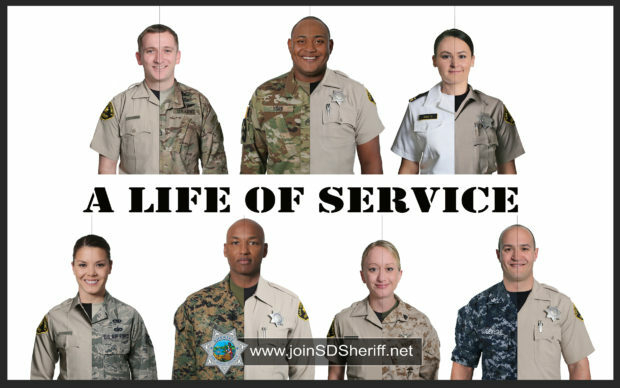 Continue your life of service, and be the difference in your community, visit joinsdsheriff.net.